I talk to writers every week who are thinking about self-publishing. It’s a major step, and each person takes that step in their own way. People seem to be most influenced by their own professional background, and sometimes by knowing someone who published a book. A big part of my job in these talks is asking questions, trying to see how far into the process they are. Over the years I’ve been working with self-publishers, I’ve gradually simplified the questions I ask. One of the best things that comes out of these talks is a clearer picture of the issues they are facing. I try to put the pieces together, show how they fit, when everything seems confusing and disjointed. Publishing a book is actually pretty complex. The problem is that we take books for granted. Most of us have been reading from the time our parents or early teachers could get us started. They read to us, made sure there were books in the house. Books are so common, such everyday objects that we don’t realize everything that goes into them, until we have to make all these decisions ourselves. Then it starts to get complicated pretty fast. If you’re thinking about self-publishing and you’ve never done it, you can have a little “consulting call” with yourself. I’ve cooked down the gist of my talks with authors into the following 9 questions. So go ahead and interview yourself. Try to answer as if we’re sitting across a table from each other at Peet’s Coffee in San Rafael. How do you feel about starting a business (or expanding your business, if you already have one)? A big misconception about self-publishing is that it’s all about literary fulfillment, self-validation or artistic expression. Very soon you will learn that publishing is a business, complete with the need to keep records, pay taxes, organize a business structure and many other details of business life. It isn’t any more complicated than many other home-based businesses, but it isn’t any less complicated either. What’s your attitude toward business? How do you feel about marketing, does it fill you with excitement, the thrill of the hunt? Or make you want to hide under the covers? What would make you feel the publication of your book was a “success”? Do you have realistic expectations for your book and your publishing company? Is the only measure of success a movie deal, a seat on Oprah’s couch, your mug in People magazine? Those outcomes are pretty unlikely, no matter who you are. Can you define what would make you feel successful? Is it a number of books sold, or getting a book review in a particular publication? The last time I calculated, I think the New York Times reviews about 2,500 books a year. Out of 400,000 or so? This one is crucial, so give it some thought. Is it essential that you see your book on the bookshelf of retail bookstores? Another big one. 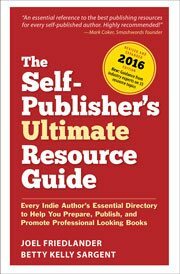 The majority of self-publishers today are publishing almost exclusively for online sales. The difficulty of getting into bookstores, and the reality of what it actually takes to run a national marketing campaign that would drive people to stores looking for your book put this option out of reach of most people. Exceptions are genres that are served by specialty bookstores where it might be easier to get on the shelf than in general interest or chain stores. If you decide to go for bookstore distribution, it will influence many of the decisions you have to make while preparing and producing your book. For example you’ll certainly need to have the book edited by a professional and you’ll need to pay for a real book cover design and at least a serviceable interior. You’ll be selling at a deep discount and facing an uphill battle looking for acceptance. You’ll need reviews, media kits, some kind of launch to let people know your book is out there. And of course, you will have to solve the number one problem that keeps self-published books out of bookstores to begin with: lack of distribution. Are you sure you don’t want a traditional publisher? In other words, are you excited about publishing your own book, or are you on the rebound? Feeling rejected by your lover? Want to get even, show them what you’ve got? Hey, none of these are wrong reasons to self-publish, but ask yourself just how far those emotions will get you. Six months or a year from now, will you still be feeling the same way? Can you identify or contact a niche group of people interested in your topic? Nonfiction self-publishing is easier to get started in if you already know your target audience. Ideally, you are yourself a member of the target audience. You have a community you’re a part of, or you’re an expert in your field, or you already have a public eager for your writings. It can’t be overstated how big a difference this support can make when you’re trying to get traction for your book. Have you thought about what kind of self-publishers you’ll be? Are you a DIY, Online Merchant, or Competitive Self-publisher? Do you intend to do most of the preparation work yourself? Are you determined to learn how to typeset your own book? This question relates directly to the answers you gave to questions 1. and 3. above. If you want to sell in the bookstores and garner reviews for your book, you’ll need to approach publishing with both the determination to get the help you need to create a professional book. And the budget to pay for it. Remember, this is a business. These expenses are investments in a product with—in many cases—a very long shelf life. Do you have a plan to learn the nuts and bolts of publishing? If you plan to hire professionals the whole way, your task will be easier, although you still need to know how to hire the right people for your project. But all the rest of the details of publishing will be up to you. How will you learn about discounts, shipping, print on demand, and all the other details of your new publishing business? A good place to start might be getting a copy of Dan Poynter’s Self-Publishing Manual or one of the other comprehensive books on self-publishing. Are there other books, products or services you can sell once your book is established? Do you have a “fire in the belly”? Publishing a book yourself and trying to sell it can be a tough job. There’s a lot to learn, and like most businesses, it takes a while to see results. One thing you can’t buy is motivation. Be honest with yourself. Are you excited about self-publishing? Are you just beside yourself waiting to see your book in print? Are you obsessing about marketing plans, scheming how to get book reviews, figuring out how to pay for an editor? These are all good signs. You’ll need that drive to see you through to your new life as a self-publisher author. How did you do? Did you think of any questions I didn’t mention here? I’d be interested to hear them. Takeaway: Taking an honest assessment of yourself and your skills before self-publishing can be revealing and helpful in the long run. I am writing just so I can have the novels completed and I will probably put my work out there on say amazon or something but it would only be to more or less say I have work out there. Im not really interested in “running” a business or turning it into a big film or any of that. Ideally I want to write my novels on my time and have them distributed…wherever. It really doesn’t matter where. I know that in itself is a business decision but aside from the things i would have to do, should I really self-publish? I really don’t have a desire for running a business. Thanks. I found you website about a week ago and have already benefited form your advice greatly – It has led me back into my manuscript for edits. One thing which hasn’t become clear to me is – must I start a publishing company? Why would I need to or want to? Good question. I’ve written about this, and you can find links to those articles in the “Getting Ready to Publish” topic located in the “Start Here” box in the left sidebar, above. If you already have a business set up for some other purpose, you can probably use that. If you plan to publish strictly as a hobby, you may not need a “publishing company” at all. But a proper company will be an advantage in many ways, from a more professional appearance in the publishing world to an easier path for deducting lots of expenses you encounter on your taxes. I have never and I mean never, worked so hard in my life. I knew setting up an independent publishing company to self publish my book along with doing everything myself was going to be difficult, but I had no idea. I am now a graphic designer, website builder, typesetter, marketer (bad one 4 now), an accountant and oh yeah, a writer. I have a million books that I’m reading on self-publishing even as I’m trying to get my own book in print. If you asked me I would have said that any fire in my belly was put out by confusion, anxiety and fear but under it all is a will to succeed and a determination to see the fruits of my labor done just right. I have to say, that’s a little scary to hear. Because I feel I’m in the same position: I’m preparing myself going in, so I feel like I know what to expect, including that it’s going to be really hard. And yet, it sounds like it will surpass even my expectations of how hard it’ll be. my only consolation is that I also feel that underneath any qualms or fear I may have is a determination to see this through. So maybe there’s hope after all. S.S., I truly hope that by now you are the proud author of a fabulous book that readers adore! For me, ditto everything you said, except I didn’t buy any books about the process, just researched endlessly on line. Only the excitement trumped the shock at the volume of what I needed to learn and DO. I admit Oprah entered my mind (doesn’t she enters everyone’s? ), but the mirage of the published book, even with no cover yet, was what kept me truckin’. Let’s just say that the day my book came out on Amazon, I went on a 40-day juice fast. Seriously, and it was EASY compared to the year preceding it. But my book came out, with a cover I designed and still enjoy, and when I recently started formatting my second book, it was about 95% easier! The reasons I did everything myself, everything, was because I have about 9 already-written books to follow, so it seemed financially worth the learning. However, without a shadow of a doubt, if I had beaucoup bucks, I’d hire professionals every step of the way!! So Sistah, I hear ya! To Joel, Reading your blogs again today, almost a year and a half after my first book came out, I can’t tell you how helpful and emotionally supportive you’ve been to me. The combination of extremely useful information and sweet kindness that you put forth were (and still are) a constant go-to for me during an otherwise solo undertaking. And there’s a nice feeling of graduation now that I’m one book in; I so clearly recall my early probes into all this. Joel, it’s not without mega-thanks to you, and your willingness to share your vast experience (always in concise and comfortable language), that I actually did a good job publishing my first book and that I still have fire in my belly for the winding road ahead! You’re the best. Yes Ava, I’m a proud author of a published book and yes, all the blood, sweat and tears has been worth the extraordinary feeling of holding my finished book in my hand. Joel and his website have been a great source of information and inspiration. Continued success to you and everyone who decides to take on the self publishing challenge. I have been all my life out of the next few stressful times of my life I will have to say that all the other sites that have been given the allusion the publishing process just a few easy steps. I am very happy to add this is the biggest lie I have been a witness to. I will have an idea for a few simple instructions. place the next few months to get to just about any other level of the writing world into the world with these new ideas. I will have to say that I wish I could have the typewriter publishing back in the world. Excellent site Joel. I found you through Sheley Hitz’ tweets… good stuff! It will help me a lot with my first self-published book I’m about to release this summer. Awesome, spot-on questions, Joel. And I passed with flying colors. (Book’s not finished but I’ve already made it my business to learn about self-pubbing. Never too early…) Guess I made the right decision. That’s great, Monica, you’re off and running. Education makes all the difference. I am the procrastinator. That being said, when I write I experience a blissful excitment that flows through my body. I am far from finishing my first book but I know it’s something I must do. Many regrets in life I do have but not finishing my first short novel will not be one of them. Once again Joel thank you for your time and effort to create a forum for us to become inspired and educated. Can not overstate how much I appreciate your help in the self-publishing area. I am about to enter and scared to death. You are a God send. Dawn, I’m glad to help. If you have any questions specific to your project, leave them in the comments and I’ll try to address them. Good luck! Ian, thanks so much for your comments. Unfortunately you caught in my spam filter, sorry about the delay. Sure, there are many nonfiction books on topics in which there are ample opportunities for affiliate sales. Particularly if you use the products yourself, your readers would likely be interested. Vincent, thank you very much. I look forward to hearing your progress. Bubble, it’s amazing how many otherwise level-headed people just don’t think to ask themselves these questions. Thanks for your support! Remarkable post! Love number 1 – I wonder just how many self-published writers know the number of books they need to sell to break even? I have read “all” of your articles since I found out about your site last month and I will definitely contact you for your self-publishing services early next year or sooner. These questions are exactly what I needed to examine what I really need to focus on while working on my material. Carolyn, thanks so much. I think you’ll find, if you’re already familiar with the publishing process, that having your own publishing company will work out better if you plan to have multiple titles. They help sell each other, and you maintain complete control of the book and don’t have to “share profits” with anyone. Kim, I really appreciate that! Thanks for stopping by. Great questions! Having recently self-published my first book, your points are right on target. I very much enjoy your updates. That was a great article, I self published my book through a company that helped self publishers, however as I have a few ideas for some more books I would like to do them completely on my own maybe even become a small publishing co. (Although These projects are on the back burner for now while we get another business up and going). Some good questions you have there, I’ve told people that if you think writing a book is hard wait until you try selling the bloody thing! I think too many people see all the famous Authors and think “I’ll write a book and make a million” and don’t realize the real world doesn’t work that way and how much hard work is involved once it’s published. Thanks Again for the article, I’ll be sure to grab Dan Poytner’s book. Fantastic questions Joel. I really like question 8, the additional product stream. Another great way is to become an affiliate of other peoples products/service then you cut down on creation time. Just be sure though to actually have used the products services before you use them.